This is where you will find out what you need to do to ship a slide to us for work. You will also see what you should not do. Please pay close attention we will give you the best advise to get your slide to us in one piece and with out damage. The first thing you should know when shipping anything to us is the address of course. If you have to use UPS or FedEx E-mail us and we will let you know were to send the package to. Although I will let you know over the years we have had the most trouble with these services. Since we are on top of a hill they don't always like to drive up and will sometimes just leave the package unsecured at the bottom of the hill right next to the busy highway. We go out of our way to one of the nicest small post office`s in the area. So rest assure your package will be secure until we pick it up. The USPS small flat rate box is what we recommend for you to use when shipping us slides. USPS Priority mail tape that is available for free at your local Post Office. The great thing about the post office is that they will provide you with free box`s and tape for you to ship your items to us. 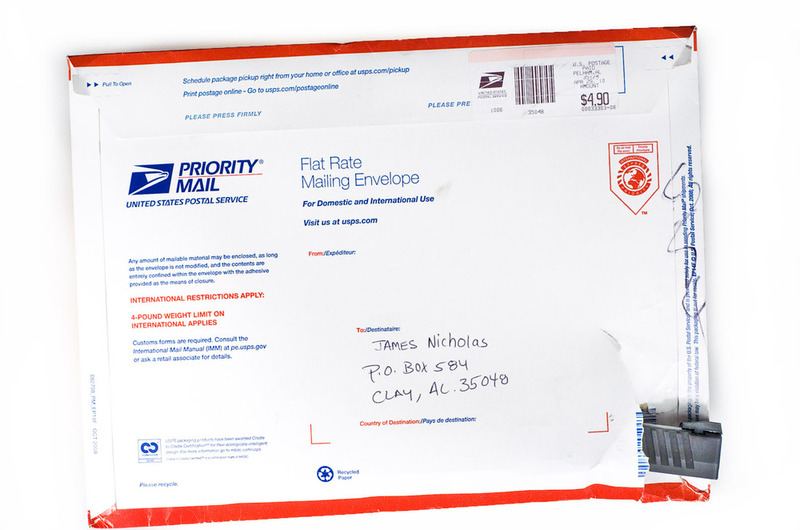 The box I recommend for our customers to use is the Priority Mail Small Flat Rate Box 8 11/16" x 5 7/16" x 1 3/4". It is about the size of a VHS tape and will fit all of the different size XD and HS2000 slides easily. USPS Priority small flat rate box with extra tape applied. No matter what box you do use to ship your items to us please make sure to use extra tape. If you are at the post office they will provide you with free tape. One strip of tape over the flap goes along way to make sure that your box does not pop open during it trip to us. Although tempting don't rely on the adhesive on the priority box`s alone. I have seen to many of the flaps fail if the box ends up getting deformed if its crushed or mishandled. XD Slide that is wrapped in plastic. We do not recommend you send your slide to us this way. We get allot of slides that are sent to us wrapped in non breathable material. We have seen everything from bubble wrap to large zip lock bags. I would not recommend this since this can promote rust. This how we recommend you send your slides to us, wrapped in some type of paper. This is just to make sure that your slide is not bouncing around in the box during shipment. This is how we prepare the slide for return shipment in order to insure the slide returns to our customers in the best condition possible. First we oil the slide over all exposed areas. We will then wrap the slide in a butcher or news paper so that it is cushioned enough from moving to much during shipment. The butcher or news paper that will directly touch the slide will have oil wiped on it as well. The oily paper makes sure that the oil will stay in contact with the slide so you should not have to worry about rust. If you follow our example you should not have any issues when shipping your slides to us. I would not recommend using the priority paper envelope shippers. These are made out of a thin card stock and are easily bent and ripped. Above are two examples that were sent to us both with holes in them when they arrived. One even had the slide already falling out when we picked it up in our bin.